All space enthusiasts are very accustomed to watching Apollo 11 launch footage provided by both NASA and the media. But many people seem to forget that on that day in July 1969 there were numerous amateurs with their film cameras at the vicinity of Kennedy Space Center, all capturing that historic moment. Are any of those old Super 8 films available today, perhaps on the Internet? Have they survived over the forty or so years since then? Well, it turns out that some films have survived, but the most surprising fact is that they do not show the launch of Apollo 11 as we are used to seeing it. The following is a translation of Chapter 2 from the book Is This Rocket Going to the Moon? by Alexander Popov, PhD and is a detailed study of one of those amateur films. It turns out that clouds can tell a lot about trajectory of this Saturn V moon rocket. But to obtain this information we need first to ascertain certain facts. Many of us travel on passenger jets which usually fly at 30-33,000 feet (9-10 kms) altitude and passengers generally see the same scenes out of the windows: clouds below and the clear blue sky all around. But higher than 40-43,000 feet (12-13 kms) the sky is almost always clear (Fig.1a), as higher clouds are somewhat different. Ascending through thin layers of clouds, rockets can leave their "signatures" in the form of rather neat holes (Fig. 1b). Fig. 1 a) NASA aircraft at 33,000 feet (10 kms) altitude watches the shuttle Columbia (STS-2) launch; b) A hole in the thin layer of clouds, made by the rocket engines. The sun was shining on the day of the Apollo 11 launch (Fig. 2), there were a few pockets of low clouds, but the rest of the sky wasn't completely clear either. According to NASA , the sky was 90% covered with a whitish translucent haze of fine and high cirrostratus clouds. Although their height is not given in , it is known from reference [1, 3-5] that these types of clouds are rarely higher than 26,000 feet (8 kms). This is confirmed by the data  on Apollo 13: on the day of Apollo 13 launch the similar cirrostratus clouds were at an altitude of 26,000 feet (8 kms). after rising about ten times its own length. In a film shot by Phil Pollacia, the Apollo 11 launch was filmed continuously during the first 170 seconds of the launch. The vast majority of both amateur films and NASA’s recordings available on the Internet show the ascent of the Saturn V compiled and edited from separate clips, assembled from individual sequences. Andrey Kudryavets  pointed out a very interesting video [7, 8] of the launch of Apollo 11. He writes, "The video is extraordinary because the launch is shown in one [continuous] shot – taking off from the launch pad to first stage separation. There are no cuts and no editing, so it is possible to watch the initial phase of the flight in full." Phil has a Bachelor’s degree from Louisiana Tech University and a Master’s degree from Auburn University, both in mathematics. He worked at IBM for NASA. He had the opportunity to become a controller during Gemini 7/5 – the first rendezvous, Gemini 8 – the first emergency re-entry and Apollo 13. After Gemini, he became the IBM lead manager for Apollo, Skylab and Apollo/Soyuz. Phil himself shot the film on a Super 8 film camera. The shooting and playback speed has not been changed. The Apollo launch footage is one continuous shot without cuts and with no editing. Phil is now 71 years old. According to the Phil’s account, the company sent him on a special trip to observe the launch of Apollo 11. He shot the film on a Super 8 camera. His commentaries of the launch are the words of admiration and his sincere belief in this historic event – the mission to the Moon. Associated with long-term work for NASA and honestly convinced in the reality of missions to the Moon, Phil obviously had neither incentive nor motivation to shoot revelatory material. He simply filmed what he saw. This fact makes his material even more unprejudiced and more valuable in exposing NASA’s account which has come to light following analysis of his film. Fig. 3. The Super 8 camera similar to the one used,video playback speed information, and one of the frames. Fig.4 shows key frames of the second part of the sequence, illustrating the rocket launch and ascent. Each frame has its time stamp indicating hours, minutes, and seconds. We do not know which reference time Phil used, but for our study it doesn’t actually matter. 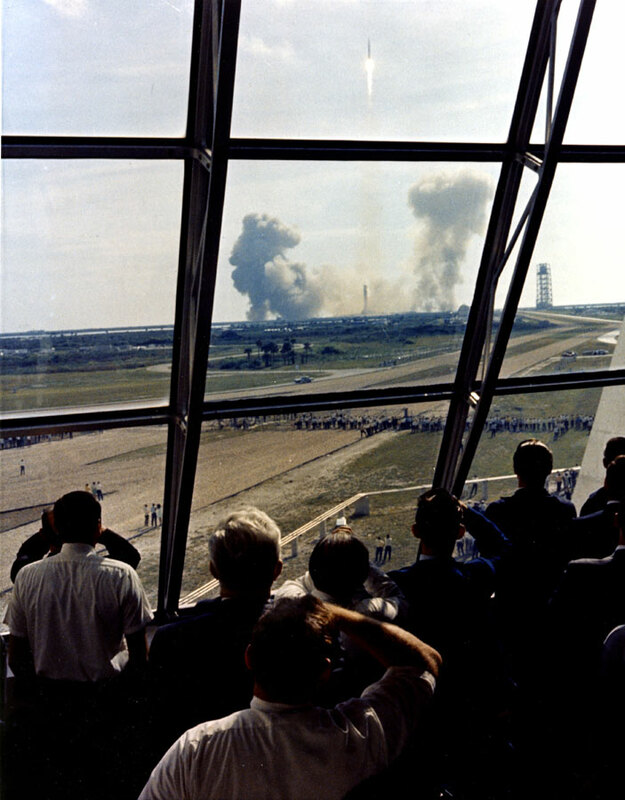 At the time mark of 1:01.02 fire and smoke beneath the rocket become visible. Hence, ignition has occurred. The rocket does not immediately start to ascend, because for a few seconds it is held in place with the engines running . After the engines reach the required thrust, the rocket is released and it starts to rise. Visually, this occurs at 1:01.05. This timer mark is used as the reference 0 second of the flight time. The clip ends at approximately the 175th second of the flight. Fig. 4. The most interesting frames from the film. Even though Phil has confirmed that the film was shot in real-time, and that it corresponds to the true rocket speed, an extra check on such an key issue was very important. At the first check point of the sequence Andrey Kudryavets writes [11,13], "Why rely on the film, [perhaps] it was slowed down? Well, its speed can be easily estimated from the time the Saturn V clears the service tower! So for the purpose of comparison we selected seven other available recordings of the Apollo 11 launch." According to NASA’s documentation , the tower clearance time is about 9.5 secs. And this timing, in my opinion, can be trusted. The fact is that thousands of professional and (most importantly) tens of thousands of uncontrolled amateur cameras were shooting this very entertaining moment. The rocket did actually clear the tower strictly on schedule. And indeed, in Phil’s film (Fig.4) we see that the rocket rises to the height of the tower on the 9th second. Other consulted recordings  provide the same result. Now to the second check point of the film. According to NASA’s record  the separation time of the first stage was 162 seconds into the mission. And as we see in the Phil’s film, it is on this very second that a tremendous cloud of hot gas surrounds the rocket. The impression is that the rocket is covered by a blast. After a few seconds, a glowing fragment leaves this cloud (173rd second). The shooting angle and remote distance does not allow determining what it is exactly – separation of the first stage and falling back, with the leading segment of the rocket keeping on going, or maybe something else. However in any event, a casual observer will assume this event to be the separation. And no doubt, that’s what NASA wanted. The film-maker has confirmed that these events play back in real time. This is verified twice: at the beginning of the film on the 9th second, and at the end on the 162th second. Consequently, the film rate is confirmed as being correct, and the recording of all these events is accurate throughout the entire film. Over the course of the film one can see other evidence, not as obvious, but nevertheless straightforward and clear. When viewing people walking around all movements are absolutely natural and occur at normal speed. Therefore, the timer on Phil’s film can be relied upon. Having established this timing with confidence we can see at what moment the rocket passes through the third and the highest layer of clouds (Fig. 5). Fig. 5. The rocket goes through the upper layer of clouds at the 105th second. We now take a look at the four frames from the 104th to the 107th second, inclusive. The first and the last frames in the series are shown in full, and two frames in the middle are shown partially in order to save space. On the 104-105th seconds the rocket is approaching the upper layer of clouds, but it is hard to understand where it is: already in the cloud, or yet to enter it? The next two frames make it clear. On the 106th second, a shadow appears to the left of the brightly-glowing plume area. At the 107th second it is quite distinct. This is a rocket which has already made it through the clouds, punched the hole, and cast its shadow on the clouds. And all this is shown as if being projected on a screen and it can be clearly seen from the ground because the top layer of clouds, are quite smooth and transparent. Having understood this picture, we can more accurately determine the moment the rocket passes through the clouds. At 106th second the shadow has already started to form. Hence, the rocket’s nose is already above the cloud layer. But on the 105th second mark the shadow has not yet appeared. Therefore, it is the last second, when the rocket has not yet pierced the clouds. So we can accept the 105th second as the time of passage through the clouds. The upper layer of clouds, as we know, is located at an altitude of ~26,000 feet (8 kms). At the time of ~105 sec the rocket is flying at an altitude of ~26,000 feet (8 kms) whereas according to the Apollo 11 timing  (and in Table B-1 below) at this moment it should be far, far above the clouds, at a height of 79,000 feet (24 kms). This means that the craft was lagging three times behind NASA's actual ascent record. "With such a start to the flight, the Apollo 11 craft had no chance of catching up with the required ascent schedule", states the veteran of Baikonur Cosmodrome N. V. Lebedev. Indeed, according to NASA's records, the burn of the first stage of the Saturn V is about 60% of 162 seconds. Respectively, by 106th second the first stage has burnt about 60% of its fuel, and it has made less than 1/8th of its required journey. And so one can reasonably ask: where will this rocket finish its flight, if not in waters of the Atlantic Ocean? And hence a very obvious question now follows: who wants to end his days with a flight during which there’ll be a disastrous crash into the water, and (quite possibly) never surfacing? Therefore, the most likely scenario is that the rocket was unmanned. Measuring the speed of the Apollo 11 Saturn V at the 108th second into the flight (immediately after passing through the upper cloud layer). In addition to the foregoing analysis, this appendix provides some extra material. A reader who may need reminding of the basics of school physics and mathematics can skip this section without affecting understanding of the topic. All the major findings have been covered above. This appendix supplements the main text. There is no way that a train can travel at a scheduled speed, with the mileposts passing with any serious delay. Therefore, if the Apollo 11 Saturn V was three times behind its scheduled climb rate, then it has to have been climbing at a much slower rate than required for the mission to succeed. Fig. 6. Excerpt from the Table B-1 in Apollo/Saturn V Postflight trajectory – AS-506 . Phil’s footage allows us to check this number. In order to do that we have to find out how fast the shadow was moving away from the centre of the hole in the clouds created by the rocket. Fig.7 below shows the positions of the rocket shadow relative to the hole in the clouds for the 107th and 109th seconds into the flight. Here we introduce the notation: l - length of the rocket shadow, and L - distance from the tail of the shadow to the centre of the hole. Moving away from the hole as the rocket rises the shadow preserves its shape rather well. Therefore, the cloudy translucent screen is pretty smooth. It is important to accurately measure the speed of the rocket. The key idea of the method is that when the shadow has gone its one length "l", it also corresponds to the rocket having travelled one length of itself. Fig. 7. As the rocket rises above clouds the shadow of the rocket is moving away from the centre of the hole. This idea is illustrated in Fig.8 below. The only clarification required is why this picture specifies the rocket length of 100m. The rocket height from the engine nozzles to the tip of the Launch Escape System (LES) on the top is 110m. This is true, but it is doubtful that the shadow of the thin (1m) and long (10m) LES is visible on the layer of clouds. It is indeed not visible, even if one looks really carefully. After all, the screen is not that high quality. Therefore, it is believed that the part of the body, which makes the shadow, has a length of 100m (i.e. without LES). Fig. 8. Explanation to the method of measuring the rocket velocity based on the moving shadow. To measure the velocity of the rocket, first for six different frames as on Fig.7, the rocket shadow l was measured in mm on the computer screen. An average value of l = (39 ± 1.5) mm was calculated. A very small error of (2) ± 4% shows that the result of our measurements is not an assessment of speed of the rocket, but it is a highly accurate measurement. This result is NINE times slower than that which NASA claims (1). The authors wish to express their special thanks to the Russian researcher A.V.Kudryavets who studied the film footage. Alexander Popov was born in 1943 and graduated from the Moscow Engineering Physics Institute (MEPhI) Department of Experimental and theoretical physics in 1966. He spent time in special design departments, but mostly he worked in MEPhI. In 1973 he received his PhD in MEPhI with his thesis on "Investigation of the interaction of optical radiation with the active medium of gas lasers." In 1984 he became a Doctor of Physical and Mathematical Sciences in MEPhI with his thesis on "Laser absorption analysis of molecular gases." He currently teaches physics at a private school. Alexander Popov is author and co-author of 15 inventions and more than 100 publications in the field of laser technology, spectroscopy, absorption analysis, gas analysis, and laser optics. With his developments he has participated in the Exhibition of Achievements of the National Economy (VDNKh). He is decorated with bronze (1978) and gold (1981) medals of the Exhibition, and a medal "850 years of Moscow." Popov recently wrote Americans on the Moon: a Major Breakthrough or a Space Scam? in Russian, 2009. Andrei Bulatov graduated from Technical University in the Soviet Union. He became seriously interested in the veracity of Apollo program after reading the book NASA Mooned America! by Ralph René. Prior to that time, Andrei Bulatov had no doubts at all regarding the reality of the Moon landings accomplished by American astronauts many decades ago. Since then he has become deeply involved in studying this subject, and is now engaged in conducting his own investigations, based on various documents published on this topic.